Software Shortlist offers a range of marketing and lead generation solutions for enterprise software. We work with leading global vendors and quality service providers around the world in a range of software categories, in particular ERP and CRM. See below for more details on our offerings. If you’d like to receive “Opportunity Alert” emails for new leads, please subscribe using the form below. These are offered on a pay-per-lead basis, invoiced only once you are shortlisted by the prospect. Refer below for further information. Software Shortlist connects software vendors and resellers with sales-ready prospects. Our lead generation program offers a flexible and low-risk way for you to grow your business with genuine buyers that have been well-qualified and want to speak with relevant vendors. Free Opportunity Alerts. Only pay for introductions to prospects you want to talk to and that you have a good chance of winning. Get connected to genuine prospects with confirmed requirements who want to talk. Limited to a shortlist of introductions per prospect. Software buyers find us through search engines, social media, and referral partners. They register with us to download useful content like our ERP Buyers Guide or request a shortlist of relevant solutions to accelerate their search via our free Get A Shortlist service. Our expert consultants call them up to see if they have a genuine software requirement and are actively looking to speak with vendors. If so, they undertake a detailed consultation (usually by phone, occasionally via email) to qualify the prospect’s software needs in detail. We gather typical BANT details (budget, authority, timeline, need) as well as explore a range of critical issues such as their motivation for a new system, what they’re currently using, who else is involved in the process, what systems if any they are already considering, etc. These notes are written up in detail in our system, and we set the expectation with the prospect that we’ll introduce 3 to 5 relevant vendors for them to talk with. Project Management software for engineering consultancy firm in Australia. To request an introduction to a prospect that you believe you have a good chance of winning, click the Request an Introduction button in the Opportunity Alert email. This opens up an email and you should explain briefly why you are well-placed to meet their requirements (which we may use when making the introduction). If you have a question, for instance if you think it might be a prospect you’re already working on — then simply email us at leads (at) softwareshortlist (dot) com and ask. A request for introduction is considering a binding purchase order. If we get too many requests, Software Shortlist makes a judgement call about which ones to introduce (you will be informed if we can’t accept your request). By limiting the number of introductions to a shortlist of 3 to 5 vendors, we ensure prospects get enough choice without being overwhelmed and give you a great chance of winning their business. That’s the power of a shortlist! The prospect is emailed with an introduction to your company as part of their suggested shortlist. You are carbon copied (cc’d) on that email. We email you full contact details and qualification notes so your sales team can follow up for a productive sales conversation. We send you an invoice for the introduction fee. We recommend that your sales team follow up promptly by phone and/or email with the prospect. They will be expecting your call. We work with software vendors and resellers of all sizes. Whether you’re a global leader or a small nimble startup, we can help connect you with relevant qualified prospects who are keen to talk. To subscribe to receive Opportunity Alert emails, simply fill in the form below and we’ll add you to the list for future notifications. ERP Shortlist and CRM Shortlist are dedicated zones on our website that showcase leading ERP and CRM solutions online, helping you engage with serious prospects through a detailed profile and downloads of your case studies & whitepapers. Software Shortlist and its partners contribute expert articles, Buyers Guides and other resources to provide a content-rich zone that attracts thousands of new prospective buyers from around the world each month. Be amongst the leading vendors featured on our Online Shortlists, with a detailed profile page to communicate what makes your solution distinctive. Generate leads from prospective buyers who register to download your content, included in your membership. Engage them with customer case studies and demonstrate your expertise with your whitepapers and thought-leadership. All members of ERP Shortlist and CRM Shortlist receive a 50% discount on the standard price for leads purchased from Software Shortlist via Opportunity Alerts. Membership of an online shortlist starts from just $300 per month for Bronze, with additional marketing benefits available for Silver and Gold members. A minimum 6 month commitment applies, and discounts are available for longer terms or multiple memberships. For more information, download our Services Overview. 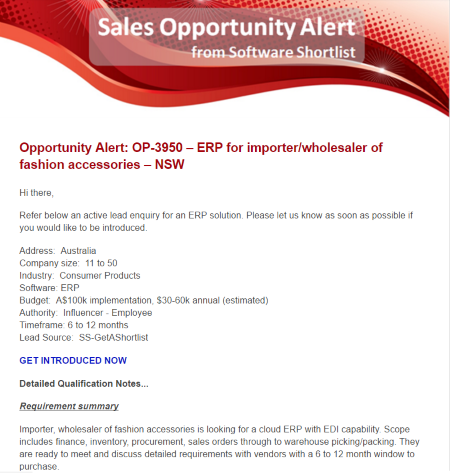 We also encourage you to see how it works for yourself by visiting ERP Shortlist. We also maintain an extensive directory of solutions in a range of other software categories, including accounting, timesheet, professional services automation, online database, payroll, and many more. Explore the software directory and if you’d like to be added you can request a listing online. To discuss further, please see the next steps in the panels above or contact us.